Hizb ut-Tahrir (HT), a transnational Islamist movement described as a “conveyor belt” for jihadist terror, is preparing to play a much more active role in recruiting American Muslims. Although the cancellation of HT’s U.S. Khilafah Conference this month was a setback, the group is likely to persist in its American recruitment efforts because it is committed to its ultimate mission: establishing an international Islamic caliphate (Khilafah). The organization’s activities in Great Britain – perhaps its leading Western hub – may offer a clue as to the group’s intentions in the United States. Hussain believes Hizb ut-Tahrir in America is about to enter the second stage. That’s where HT was in Great Britain back in 1993, when Hussain, then a teenager, was caught up in a wave of activism. Eventually, Hussain drifted away from Hizb ut-Tahrir, only to move back into its orbit while attending college in London around the time of 9/11. Shortly after those attacks, he gravitated toward a number of “far-left, socialist” parties, but retained his connection with Islamist radicals as well. Only after the July 7, 2005 subway bombings did Hussain make a clean break with radical Islam. Today, he is director of outreach and training for the Quilliam Foundation – a research organization that works to educate the public about the dangers of Islamism. For example, HT has suggested that Pakistan’s nuclear arsenal could be used as a weapon against the United States, said Houriya Ahmed, a research fellow with the Centre for Social Cohesion, a British organization that monitors radical Islamist activity. While HT’s strategy and tactics are different from those of Al Qaeda, “the end goal and ideology are essentially the same,” Ahmed told the Investigative Project on Terrorism. Both organizations seek to impose a caliphate and both justify terrorism and jihad to get there. 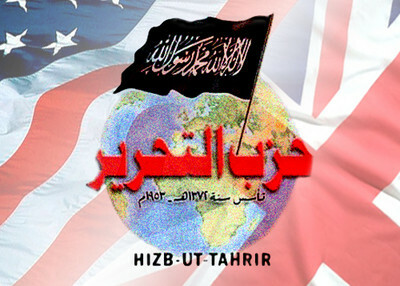 Hizb ut-Tahrir officials have denied their group supports terrorism. At last year’s Khilafah conference in Oak Lawn, Illinois, for example, HT spokesman Mohammad Malkawi labeled such charges “absurd” and “baseless” (but refused to condemn Al Qaeda and the Taliban). Malkawi said Hizb ut-Tahrir only wants to institute a caliphate in existing Muslim-majority nations and does not seek to impose it on Western nations like the United States and Japan. Ahmed, co-author of Hizb ut-Tahrir: Ideology and Strategy, (arguably the most definitive study of Hizb ut-Tahrir), countered that such reassuring comments are extremely misleading. She makes a powerful case that HT’s ultimate goal of establishing a worldwide caliphate cannot possibly be achieved without massive violence. Hizb ut-Tahrir is particularly interested in a caliphate in Pakistan “because it has nuclear weapons,” Ahmed said. HT tried to realize the goal by recruiting members of the Pakistani armed forces who received training at Sandhurst, an elite British military academy, and sending them back to Pakistan to carry out a military coup, said Quilliam co-founder Maajid Nawaz in a Pakistani television interview. He is a former member of Hizb ut-Tahrir’s British affiliate (HTB) who was sent to Pakistan to set up the organization’s chapter there. In her book, Ahmed cites numerous HT statements showing a willingness to support violence in order to achieve a caliphate. For example, in September 2008, HT Pakistan issued a leaflet exhorting Pakistan’s army to use nuclear weapons “to injure and bruise an already battered America to an extent to which she cannot afford to stomach right now.” The video was uploaded on HT-Britain’s website. HT-Pakistan issued another leaflet in July 2009 (also posted on HTB’s website) calling on the Pakistani Army to help HT establish a caliphate. Hizb ut-Tahrir literature claims the Koran justifies the use of terrorism as a means to threaten the enemies of Muslims. It categorizes Hamas, Islamic Jihad and Jama’ah Islamiya in Egypt as “legitimate Islamic movements” and claims that Western concern over terrorism it is just for propaganda purposes. Less than a month after the 9/11 attacks, HT declared that all Muslims are in a “state of war” with the United States and Great Britain. According to an HT leaflet, Washington declared war on Islam and Muslims after 9/11 by attacking the Taliban regime in Afghanistan. After uniting the caliphate, HT seeks “to expand to non-Muslim majority countries, which would involve killing millions more” people, Ahmed said. Despite HT’s radical views, the organization has won praise in the past from Imam Siraj Wahhaj. He attended an August 1994 event at Wembley Arena in London, where speakers declared their support for jihad, declared Islam “the only alternative for mankind,” and attacked democracy. Watch video and excerpts of some of the speeches here. “Whether it’s soft Islam as in ISNA or revolutionary Islam like Hizb ut-Tahrir, it’s troubling,” she said. Ghaffar Hussain has good news and bad news to offer regarding Hizb ut-Tahrir’s future in the United States. The good news is that in country after country HT membership seems to operate in “20-year cycles.” After emerging on the public stage and attracting new recruits, the group starts losing members as people learn what it really stands for. The bad news is that, even with declining support, Hizb ut-Tahrir remains dangerous because its sympathizers operate as “salesmen for Al Qaeda’s world view,” Hussain said. Hizb ut-Tahrir works to increase the supply of potential jihadists by exposing as many young Muslims as possible to this violent revolutionary worldview. As in other countries, the danger for the United States is that Hizb ut-Tahrir disseminates this narrative and that individuals take action based on it.